Since he first stepped on Cuban soil —which, according to doomsayers, he did with his left foot—, until he closed the door behind him of the Air Force One to fly to Argentina, US President Barack Obama closely followed an agenda planned to the last detail by his advisers, which he fulfilled quite naturally. Obama smiled all the time. He smiled when touring Old Havana under a merciless rain; when paying the bill in a private business and left, as outlined, a respectable tip. He smiled even when asked about his possible visit to Fidel, and evaded the answer with a trick worthy of the career politician he is. He wanted to dazzle. And I have no doubt that to some extent he succeeded. But only to some extent, I stress, because taking into consideration the large experience Cubans have to discover the fifth leg of the cat and their good nose trained to interpret second, third and even fourth readings, I don’t think they will all be fooled. Now that the US president visit is already a thing of the past, and that interpretations of the day after begin to proliferate like weed, I wonder if we will be able to find the midpoint in the broad spectrum of positions ranging, undoubtedly, from blind enthusiasm to the denial of barricade. Or, what is the same: from the “welcome, Obama” to the “Obama, go home”. Raul Castro himself has been saying so since, on December 17, 2014, he announced the restoration of diplomatic relations with the United States and, incidentally, shuffled the domino which everyone believed was closed off. “We must practice the art of civilized coexistence, which means accepting and respecting differences and not making them the center of our relationship, but rather promoting ties that benefit both countries and peoples, and concentrating on what brings us closer rather than what separates us”. This was expressed by the Cuban president in his statement to the press, after his official talks with President Obama last Monday. And civilized coexistence, in my opinion, starts with an undeniable fact: if Cuba and the United States, 90 miles away from each other, have been engaged for more than half a century in a back and forth of antagonistic attitudes, unilateral sanctions and open forums, it’s not precisely because Cubans enjoy pounding nails on their heads. There is no masochism at all in a story that, to be fair, began long before Obama was born. He knows that because he is, as Cuban analysts have admitted, one of the most intelligent and skilled leaders in the history of the United States ever. 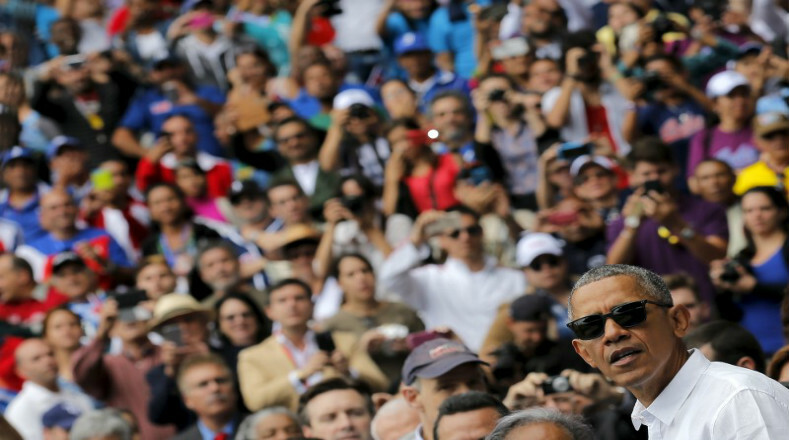 He knows —and he takes this fact into consideration in his speeches— that he cannot come face to face with an island that has weathered the storm with strength and pride, “much pride”, as Obama himself acknowledged, and with which no understanding would possible if he doesn’t start from a key statement: “El futuro de Cuba tiene que estar en las manos del pueblo cubano”. But civilized coexistence is also using proper names —not euphemisms— to call the harsh areas which might undermine understanding. In his message to the Cuban people from the Gran Teatro de La Habana Alicia Alonso, Obama said that “the very real differences that we have — about how we organize our governments, our economies, and our societies. Cuba has a one-party system; the United States is a multi-party democracy. Cuba has a socialist economic model; the United States is an open market. Cuba has emphasized the role and rights of the state; the United States is founded upon the rights of the individual”. Reading that again, it’s obvious that these are, and not others, the discrepancies between the Caribbean nation and the First World capitalist countries, although neither the economic nor the commercial links have been so far rooted out —say for example— with Great Britain, Holland, Italy or Germany. With the United States, however, alarms are triggered. Cuba is too near the first economy of the world and has too much historical memory —no matter how much Obama has urged to forget about it all of a sudden— to ignore the theories of the ripe fruit and its most contemporary versions. History is meant to support facts, to provide context for them; because no today’s action, however good it may seem, drops from the air like a parachute, isolated from the past. Perhaps because of the suspicion with which each others’ gestures have been usually understood in both sides of the Florida Strait, now the game seems even more unpredictable for me: in the blue corner, Americans lining up to invest in Cuba; in the red corner, the island’s economy being re-structured and in great need of capital; and in the stands, a yes but no position that that hangs like a dense cloud and prevents long-term analysis. The transcendental event remains to be seen: whether it is possible to live with our differences, some of which are truly irreconcilable; if the first visit by a US president in nearly 60 years of revolutionary government will result in concrete improvements for ordinary Cubans —for all of them, not just for the so-called entrepreneurs— or if, on the contrary, it will walked through life without knowing it did, as Buesa would say. There is plenty of doubt. We would need to ask those questions not only to Obama, who has a more complicated country than ours to straighten up, but to the street philosophers, those who, trained as few on everyday economy, neighbourhood politics, and domino game, have already begun to qualify this new chapter of relations between Cuba and the United States as a necessary evil.